Why choose Pro. Clinics for Milia Removal? If you have ever noticed tiny white bumps that have appeared on your skin and wondered what exactly they are, and how best to remove them, then Pro. Clinics can help. Commonly known as ‘milia’, these small bumps should not be confused with acne or whiteheads, as they are something altogether different. The medical term for milia is actually ‘milium cysts’ It is important to understand that they are a tiny cyst rather than whiteheads, which people sometimes confuse them with. There are various methods that are available to remove milia, but the method that we have found to be the most successful is to freeze them using liquid nitrogen. At Pro. Clinics we use a small pen-like device called a Cryopen, which fires a very fine powerful jet of liquid nitrogen and is accurately aimed at the milia. Because the device is so accurate, the surrounding skin is unaffected. It is often the case that just one quick session of cryotherapy is enough to treat milia although if they are particularly stubborn then a follow-up session may be required a month later. When booking any non-surgical procedure, it is very important to conduct thorough research, which is why we always advise people to read our many online reviews on platforms such as Treatwell, Facebook and also Google. A milium cyst (milia) is a small, white, raised bump on the skin, that typically appears on the nose and cheeks, however they can appear anywhere on the face or body. 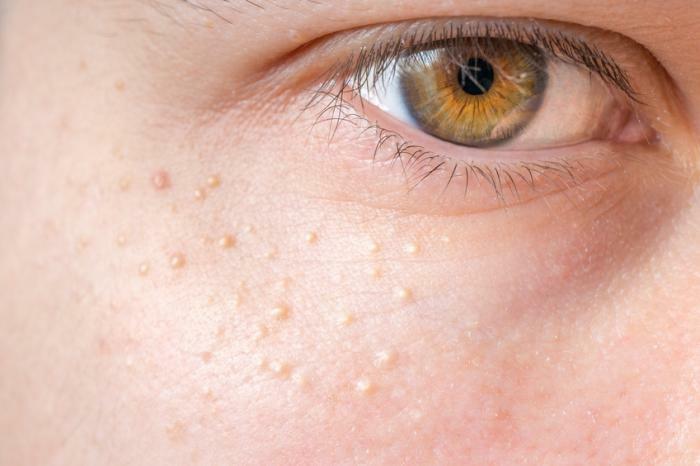 The bumps are often found in groups called milia. Milia are very common in newborn babies and referred to as ‘milk spots’. Unlike spots or pimples. A milium cyst occurs when keratin (a strong protein that is found in skin tissues, hair and nail cells) becomes trapped beneath the surface of the skin. Milia can occur in all ages but is most common in newborn babies. They are typically found on the face, eyelids and cheeks. Although not considered to be dangerous, many people do not like the appearance of milia and are therefore keen to have them removed. There are many different methods of milia removal, although at Pro. Clinics we have found that the most effective method is to freeze them using a device called a Cryopen. This is a quick and easy procedure that requires no down time. Cryotherapy is considered to be a low-risk procedure. Cryotherapy rapidly cools the targeted area and not the healthy surrounding tissue, so there is very little risk associated with the procedure. Can I have milia removed if I am pregnant? Although the treatment is perfectly safe, at Pro. Clinics we always err on the side of caution wherever pregnancy or babies are concerned. For this reason we will not treat clients for milia removal during pregnancy. Can children have milia removed? Milia are often found on babies and children. As the treatment is so safe, we are able to treat children for milia removal. As previously mentioned, we will not treat pregnant or breastfeeding women. We also will not treat those with autoimmune disorders or cold sensitivity as they would not be suitable for this treatment. It is also not suitable for those individuals that suffer from keloid scarring. What are the benefits of milia removal? There are a multitude of benefits in having milia removal, although we always stress that milia are harmless and do not necessarily need to be treated. Most milia will generally disappear over the course of weeks or months. That said, as milia often appear in clusters, we understand that they can appear unsightly and can therefore impact a person’s confidence. We have listed some of the benefits in milia removal below. By having the treatment, you remove a source of irritation. Whilst milia are asymptomatic, they can be itchy. Probably the number one benefit for people is their increased self-confidence. When milia appears around the eyes, it can be very noticeable and can often make people feel self-conscious about their appearance. Another advantage for women is the easier application of makeup and cosmetics, as their skin is smoother after the treatment. Milia can often be mistaken for whiteheads, or acne. Once the treatment has been completed, this is no longer a problem. How long does milia removal treatment take? The treatment is very quick. We use a device called a Cryopen to freeze the milia and each milia is frozen for around 5-10 seconds, meaning clients are often in and out of the clinic in a matter of minutes. What is the cost of milia removal? Our standard price is just £50 for milia removal, although the cost of treatment will depend on the type of imperfection and the size of the area. Individual costs can be discussed over the phone, or at a face-to-face consultation. You may require more than one session, depending on your response to the treatment. Should this be required, we offer this service at a discounted rate. Can milia be removed on the NHS? Unfortunately not. As milia are not considered to be dangerous, the removal of milia is considered to be a cosmetic treatment, and is therefore not covered by the NHS. What can I expect from milia removal treatment? The super fine applicator of the Cryopen is held closely to the skin imperfection and liquid nitrogen sprayed onto the distorted, unhealthy tissue only. This is usually from 1-30 seconds, depending on the size and depth. The legion is then allowed to thaw and return to its natural colour. The process may be repeated in the same session if required. No, It is virtually painless. The accuracy of the Cryopen means that healthy skin around the site of the lesion is less likely to be affected and therefore it is not painful. Treatment is generally very well tolerated, even by those with a low pain threshold. The sensation is similar to a stinging nettle on the skin when the nitrous oxide reaches the bottom of the area, but this vanishes quickly. There might be a little residual stinging for a few minutes after treatment. The area will be slightly itchy for about ten minutes afterwards and occasionally a blister might form and persist for a few hours. Does milia removal leave a scar? Generally not. Cryotherapy preserves the tissue matrix and therefore allows for proper cosmetic healing with minimal scarring. This will of course depend on your skin type and how well you follow the aftercare advice. Hypo-pigmentation in the area (a small pink patch of skin, where new skin has formed, that is lighter in colour) may be visible for 2-6 months. This colour loss may take longer to return in darker pigmented skin. Is milia removal the same if I have darker skin? Repeated short freezing cycles are generally used if you have a darker skin type. This just means that you may need two sessions, spaced a few weeks apart, to remove your lesion, rather than just one. How long does it take to remove milia? The application time is just 1 to 30 seconds, usually with one or two passes per treatment, depending on your individual assessment. Application for small lesions like skin tags & milia, is just a few seconds. We usually book a 30 minute appointment session, which gives us time to conduct a thorough consultation before your treatment. The healing process generally takes anywhere from 1-6 weeks depending on the depth and size of the lesion. Lesions usually assume a darker colour after treatment (this is the dead cells) and as the skin regenerates underneath it will eventually flake away. After care is minimal, as there is no wound or raw area. However, a small blister is not uncommon in the first 24 hours. This is reabsorbed by the skin quickly. The lesion will dry up, assume a darker colour and flake off in 1 to 2 weeks. It is very important not to pick at the area, as this will increase healing time.